This is not the beginning of the story I submitted for What Follows. Grace had gotten lucky, up until now. Her villa was far from the cities and she herself was distant, this century, from business or politics or fame. But now the city was gone, fallen into burning heaps and the heaps burned to ashes. The so-called gods and the self-proclaimed heroes who had fought over the city were dead, dying, run away, or hiding. And the armies marched on. Neither is this. But, As is often the case, they are the shell from which the final story, “Monster Godmother,” emerged. Me: So, what are you working on? Me: *Ears perk* Is it open to new authors? Because “immortals and the apoc” is totally my ball game. Ross: well, you can check. It’s like two and a half weeks till deadline, though. At this point, I was plotting Escape From Rochester (a serial of a semi-immortal dealing with an apocalypse), thinking about Live Blog the Apoc (which is pretty much what it sounds like), and, in other words, neck-deep in one of my apocalyptic settings. Immortals and the apoc was, indeed, totally my ball game. …and then I turned around and started the story three times. That happens, sometimes. The story won’t start, or it starts and then it fizzles after half a page. I do the online version of crumple up the paper and start again. This time, with a little over twenty-four hours till the deadline, I looked at my 1,164 words and was dissatisfied. I could totally complete the story – but it wasn’t the story I wanted to tell. I sat up on Rion’s bed for hours that night, doing word-sprints. And, while every other story had fought me every word of the way, this one flowed. It swam. The original concept, the bare bones, might have something to do with the first two stories I’d written, but this one had music. I wrote 4000-plus words in just over a calendar day. I’m not sure I’ve ever done that before (outside of NaNoWriMo), and I’m not sure I want to do it again, but it was fun. Sort of like the writing equivalent of extreme sports. Then came the editing, pushing words around, making them fit. Speed-editing, begging for betas, second-guessing word choices. Do I say Ellehemaei (the in-setting word for the immortal-like beings)? It seems like a stretch when nobody outside of the tiny Fae Apoc fandom knows the word. So what, fae? gods-children? Both words fit, and yet neither word fits. In the end, I ended up using “gods-children” as the most evocative, and calling it good. Then I sent it off to April, crossed my fingers, and waited. And now here we are! Several months later, with a brand shiny new anthology in front of us, “Monster Godmother” nestled in there with Ross’s story, Rion’s story, and stories from M.J. King, Joyce Chng, Kate Larking, Nina Waters, E.V. O’Day, Crystal Sarakas, Sarah Lyn Eaton, and April Steenburgh. It’s a good cozy place for it, I think. Right in the middle of the apocalypses. Today is anthology launch day! How would an Immortal deal with the End Times? The world will inevitably come stumbling into apocalypse, and They will be there to witness it. Dryads, demi-gods, deities of every pantheon- is it possible for the Eternal to handle an ending with grace? Stories by Lyn Thorne-Alder (me! ), M.J. King, Joyce Chng, Kate Larking, Nina Waters, K Orion Fray, E.V. O’Day, Crystal Sarakas, Sarah Lyn Eaton, and Ross Bennett. Available in e-book at Amazon & Smashwords. Edally Academy has its own website! Coming Soon! 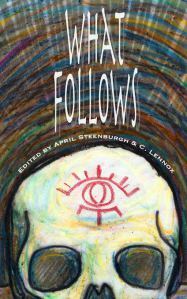 “What Follows,” an anthology of the End Times – coming out next Friday! Edally Web Page: I Still need your help! Click here for the rest of the week. Last Thursday’s Prompt was Beat Around the Bush, for 500 words. Edally Academy is on Muse’s Success! Please review! Ladies Bingo – Prompt a Square! For the rest of the week, click here.